Home / Columnists/ Emotionally intelligent leaders: A rare breed in Sri Lanka? It appears that the West and East alike have one common phenomenon - emotionally charged leaders making utterances that get wide media publicity leading to much talk in many social circles. Such emotional outbursts in the local political arena have also become a common topic these days. Why do emotions often become a double-edged sword? Let’s explore this. Leaders are supposed to be more ‘emotionally intelligent’ according to many research findings. Do Sri Lankan leaders in many fronts demonstrate their emotional intelligence? Is emotional intelligence seen more in the breach than in practice? In the olden days someone was regarded as intelligent if he or she could “read, write and do arithmetic”. Now we know it is surely not the case. People pass exams but fail in life. They strive for results but struggle in their relationships. The original Latin root of intelligence means ‘to understand’. It is in fact an umbrella term that encompasses many abilities of the brain. One such key type has emerged prominently as Emotional Intelligence (EI). How can emotions be ‘intelligent’? Isn’t it a contradiction of terms? Danah Zohar, a philosopher and physicist, states that rational intelligence is all about material capital in dealing with what ‘I think’. Emotional intelligence focuses on social capital involved with what ‘I feel’. It is to do with understanding oneself as well as building better relationships. As we are aware, IQ measures rational intelligence and EQ measures emotional intelligence. Ironically, with regards to employment, IQ hires you in but EQ fires you either up or out. It was Daniel Goleman who first wrote about the link between EI and business results. He argued that leaders have to be 70% more emotionally intelligent than the others. Whether we see this in the Sri Lankan scenario is a big question. He vividly stresses the importance of emotional control. We see how it is often violated on many occasions as communicated by print, electronic and social media. What are emotions then? Let’s discover this. One may become angry. That’s psychological. One may become hungry. That’s physiological. Both are emotions. They can be related to mental or physical aspects. I would break the word emotion as ‘e –motion’ or ‘enabling motion’. Emotions drive us to action. In essence, they are feelings and their associated thoughts. “Rule your feelings, lest your feelings rule you,” said Publilius Syrus, way back in the 1st Century BC. Essentially emotions are intense feelings directed at someone or something. Stephen Robins, a veteran in Organizational Behaviour, presents the six key basic emotions, namely anger, fear, sadness, happiness, disgust and surprise. You can clearly see more negatives than positives. That’s why we have more misery then mercy, providing enough business to psychiatrists. I still remember Robert Holden, who goes round the globe giving motivational speeches and calls himself a “recovering psychologist”. The need here is to have a more positive, pragmatic and progressive outlook. As such, emotions can be constructive or destructive. Joy can be constructive whilst jealousy can be destructive. Channelling emotions for success is what is required. The best example I can give is how the New Zealand rugby team, the All Blacks, performs the ritual Haka, a traditional Maori tribal war dance, just before a game begins. It gets them in a mood to go for the ‘kill’. There are many myths about EI. Some say it has been invented by Daniel Goleman. Nonsense. It existed in human beings since time immemorial. All great religious leaders were obviously emotionally intelligent. Take the case of the Buddha, who kept on meditating whilst three wild women (Thanha, Rathi and Raga) were engaged in a luring dance in front of him. The same with Jesus when he overcame self-pity while carrying the cross to Calvary. Great leaders such as Mahatma Gandhi, Nelson Mandela and Saint Mother Theresa amply demonstrated EI in many ways. It was Charles Darwin who first wrote about emotions in the western perspective. He published a book titled, ‘The Expression of the Emotions in Man and Animals’ way back in 1872, highlighting genetically determined aspects of behaviour. The way I see it, EI was repackaged in the West as a management concept. “People high in EI are expected to progress more quickly through the abilities designated and to master more of them,” said John Mayer of New Hampshire University and Peter Salovey of Yale University, who are regarded as the co-founders of EI in its new form. Credit should go to Goleman for bringing the sharing the concept of EI to a wider audience. His several books on EI have shed a lot light on the topic. “Rational intelligence and technical skills are important but emotional intelligence is the sine qua non of leadership,” opined Goleman. In essence, EI can be viewed as a capacity. It is the capacity for recognising our own feelings and those of others, for motivating ourselves and for managing emotions well in ourselves and in our relationships (Goleman, 1995). Despite many subsequent presentations and interpretations, I still prefer the five key components of EI advocated by Goleman. They are self-awareness, self-regulation, self-motivation, empathy and effective relationships. It will be worthwhile reflecting on Sri Lankan leaders with regards to these five components. Remember, as we discussed, leaders are not necessarily at the ’top’ but at the ‘tap’ as well. The emphasis here is more on corporate, institutional or national leaders. It is worthwhile to see what each of the quadrants mean in relation to the Sri Lankan context. Let’s go through them. This refers to the awareness of one’s emotional state. It means the ability to recognise and understand your emotions and their effects on others. 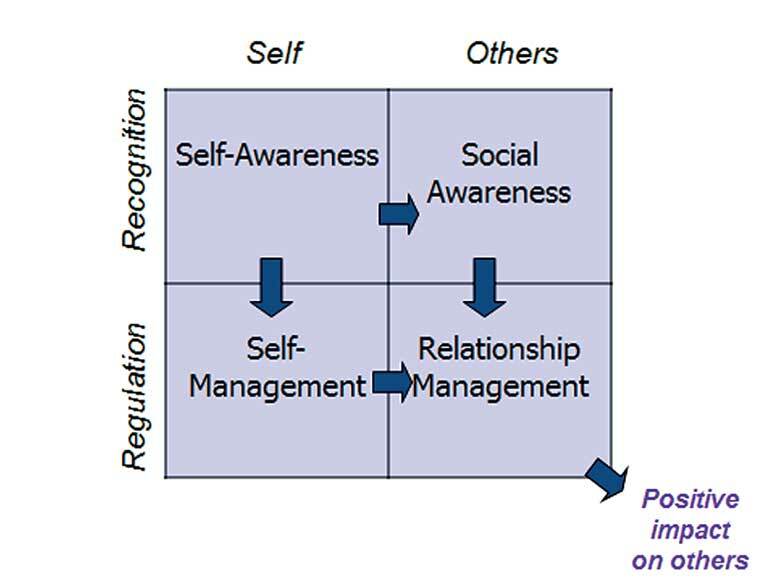 As Goleman observes, a high degree of self-confidence and a realistic self-assessment can be considered as hallmarks of people having a high level of self-awareness. I think it is directly relevant to mindfulness. ‘Sathiya’ or ‘Sihiya’ in local vernacular could be the best descriptors. Do our leaders demonstrate self-awareness? Are they conscious of what they uttered a few days ago that was widely publicised by the media, before callously denying that they actually said so things? It is a common issue in political fronts but may also happen in business and other fronts. This is logically the second step. It refers to the ability to control or redirect disruptive impulses in taking charge of you. According to Goleman, trustworthiness, integrity, comfort with ambiguity and openness to change are all hallmarks of self-management. This is also where passion comes to the surface. It refers to the propensity to pursue a purpose with persistence. The point here is that self-motivation should be beyond the monetary gains or status grabs in being clear about what one really wants in life. Organisational commitment has a close connection with such behaviours. Optimism even in times of failure can be one hallmark of such self-motivators. This of course is much evident among many prominent leaders, the way they pursue their goals. Whether such goals are congruent with a collaborative approach towards national development is the question. A statesman can be clearly separated from a politician based on the self-motivation towards serving the nation. This quadrant takes us to focus on others. It includes empathy which is the ability to understand the emotional makeup of other people. In essence, it involves walking with ‘their shoes on’. Stephen Covey in his popular Seven Habits of Highly Effective People refers to this as “seek first to understand and then to be understood”. In fact, he says it is one of the often neglected aspects of managerial behaviour around the world. Customer care, employee-sensitivity and cross-cultural communications are some areas where empathy is a must. Do we see leaders demonstrating empathy in our societies? Having one-sided views and thereby jumping to conclusions is quite common. Disputes often arise when empathy is discarded. Social media is abundant with such sad situations involving leaders. This is the culmination of all of the above. It refers to building lasting relationships. Being friendly, trustworthy and genuine may result in good social networks and solid teams. The acid test of EI is how good you are in successful and sustained relationships. How do we see relationships among our leaders on many fronts? Are they genuine or opportunistic in their associations and affiliations? Do leaders use their high EI for relationship building or low EI for relationship busting? These are the questions we need to answer. “Tenderness and kindness are not signs of weakness and despair, but manifestations of strength and resolution,” according to Kahlil Gibran. There is much more we can explore about emotionally intelligent leaders in the Sri Lankan context. Rather than cursing the darkness, let’s light a candle. Reflect on the key aspects of EI and relate it to your daily actions. I am sure we have a lot to refresh and reinforce in order to raise our emotional intelligence.